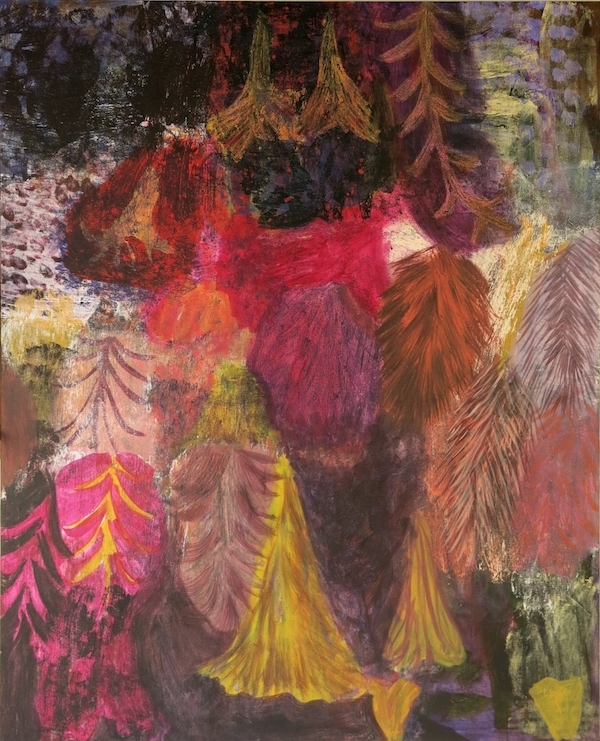 Julia Castiglioni Bradshaw, Magenta & Mauve, 2019. Acrylic on canvas, 150 x 121cm. Courtesy: the artist and Colville Gallery, Hobart. The sedimentary layers of paint are evidence of saturated colours merging, building up spatial depths and resonance. Pictorial elements are embedded and forms of flowers and other botanical motifs emerge and float within the colour fields, while the mark making, or fields of patterns, shift the focus. An enhanced tonal colour world engages with highlighted features or brilliant splashes and poised counterpoint. The paintings evolve like a year’s worth of seasons, so that as one moment gives way, another emerges, in a constant build up and erasure of marks. Julia Castiglioni Bradshaw completed Bachelor of Visual Arts, Honours, ANU, School of Art, while her extensive travels both in Europe and South America have brought a strong colour and abstraction awareness to her practise.